You may have noticed that recently I added a couple of ads to my blog over in the right-hand column – yes, for the first time in its history, this blog contains third-party advertising. Now that doesn’t mean you are going to become inundated with annoying pop-ups, slide-ins, auto-play video commercials, or anything else that interferes with your website epxerience. No, it just means that I am pleased to announce a new affiliate partnership with one my favorite biker businesses: J&P Cycles! NOTE: You do not pay more at J&P for clicking on one of my links or ads, but I receive a commission from them if you click through via my site and place an order. Right now my partnership with J&P consists primarily of the commission program. But, in the future I’m hoping to also offer product reviews and a closer look at some of the items I have personally purchased from J&P over the years. In addition to their flagship store in Anamosa, J&P also has year-round stores in Sturgis, SD and in Daytona Beach, FL. And, they own and operate the National Motorcycle Museum also in Anamosa. You may have read right here on BCN that they were recently named the Official Motorcycle Aftermarket Retailer of the Sturgis Rally. Below is a six-minute video about the history of this company that started at a motorcycle swap meet and grew into the world’s largest aftermarket motorcycle parts and accessories store. I’m excited to offer you easy shopping links to J&P any time you are visiting my blog, and to partner with this great Iowa-grown company! 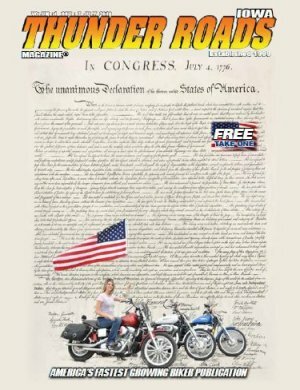 One of the neat things going on in the motorcycle world in Iowa right now is that there are several magazines of interest specifically to Iowa bikers. I’ve been fortunate to write for a couple of them, and wanted to introduce them to you in case you haven’t discovered them yet! First up is the Iowa edition of Thunder Roads. This is a national publication that publishes several state and regional editions. The Iowa edition is, as of May 2010, owned by Tina (“TT”) and Vernon Schwarte of Kimballton. Tina and Vernon are both healthcare professionals and volunteer firefighters as well as Harley riders – normally they ride around Iowa as much as possible and try to take a couple of extended trips each year. Over this past winter they were invited to write an article for Thunder Roads Iowa about the Hawgstock rally, and following that were invited to keep writing and taking photos for the magazine. Not too long afterwards they had the opportunity to take over production and publication of the magazine, and published their first issue in June. 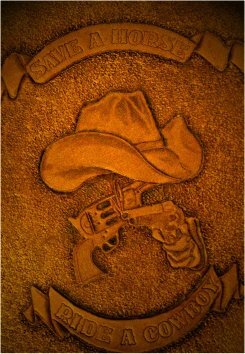 Thunder Roads Iowa is a monthly publication producing 12 issues per year, each with a minimum of 40 pages per month – no small feat! “Our focus is to promote the sport of motorcycling, no matter what brand you ride. We have the utmost respect for anyone that is on two wheels,” Vernon says. He notes they’ll be doing a few recurring features, including articles from the female perspective, profiles of Iowa military riders, and features about each county in Iowa. To suggest story ideas for Thunder Roads Iowa, or to become an advertiser, contact Tina or Vernon at tt@thunderroadsiowa.com or Vernon@thunderroadsiowa.com. Visit Thunder Roads Iowa on the web at www.thunderroadsiowa.com. Back in February, when we were all just about bonkers from the Winter That Wouldn’t Quit, we had the opportunity to visit the annual motorcyle swap meet. As soon as we got inside, I almost immediately came upon Tina Anders-Grover, a local leatherworking artist and owner of Custom Leather Design. I was impressed with the inspired hand-tooled leather bike seats on display. 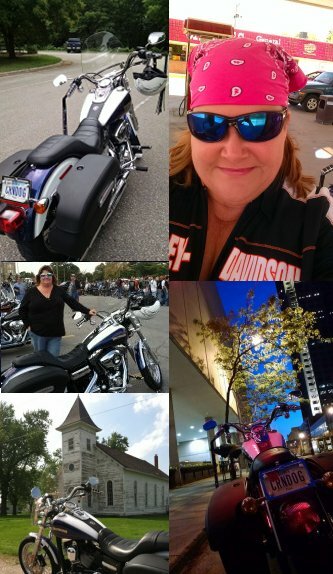 While today much of Tina’s Des Moines-based business is devoted to custom seats, she actually began her career in leatherwork when her husband needed a belt made to club specifications. Being an artist familiar with other media, Tina decided to make the belt herself. Soon she was making wallets, toolbags and other items for her husband and his biker brothers. “As an artist, to begin with, I was amazed at the ability to bring my art into 3D, and still am to this day,” Tina says. She considers the motorcycle seat to be an often over-looked canvas on the bike. Each one of Tina’s seats is a one-of-a-kind creation, hammered and crafted with traditional tools. She’ll create the design from scratch, or work from the bike owner’s design. 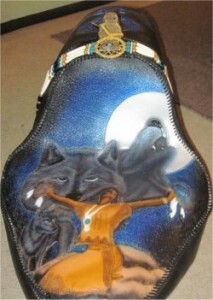 Her own bike seat brings in a variety of leatherworking techniques including snakeskin inlay, Spanish lacing, and colored mural-like images. Most designs are not as complex, she says, but every seat gives the owner’s bike a custom look. 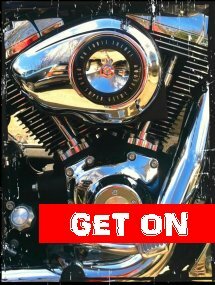 To see more of Tina’s work, or to get an estimate for customizing the “over-looked canvas” on your bike, contact Tina at 515-422-7277.